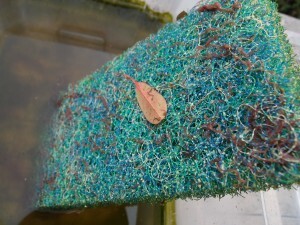 Another way to grow blackworm (Lumbriculus variegatus) seems to be on Japanese filter mats. I have a piece of that about 40 by 20 cm in a plastic tank outside. The water level is currently 15cm. The worms have settled in the mat, and I can regularly collect a clump of worms from each corner where they also accumulate. The tank has been outside at temperatures from 1 to 20 degrees, so far without problems. The food I use are spirulina tablets, but I will try to replace that by spinach or other leftover green vegetables from the kitchen. I do take care to regularly remove all other organic material than the food. The worms seem to grow larger than in my indoor culture. This entry was posted in Food, Maintenance by tvdooren. Bookmark the permalink. I use paper towels and 1 inch (2.54 cm) water in a shallow bowl. Worms use the paper as a food source. The worms are kept around 23 C (73 F). Thanks for your process. Hi, thanks for your interest. The ones indoor do/did mostly fine. I did have some trouble with Ostracods taking over a few cultures (https://www.youtube.com/watch?v=JIKBTfz7ERM). The ones outside are fine, there I just need to remove debris regularly to keep them happy. I am feeding with spirulina tabs so far. This year I want to experiment with brown paper and vegetables. They might be good in recycling some types of waste.